The Coastal Chiropractic Clinic, at 36 St Andrews Road South, St Annes, has been helping local violinist showman Gary Lovini since 2010. Since initially coming into the clinic with severe pains and stiffness, Doctor of Chiropractic Adam Carlisle helped straighten him up and has been looking after him with maintenance care ever since. Chiropractic is a health care profession concerned with the diagnosis, treatment and prevention of mechanical disorders of the muscles and joints, and the effects of these disorders on the functions of the nervous system and general health. "Here at the Coastal Chiropractic Clinic we try and help reduce the severity and frequency of aches, pains and stiffness that people suffer with regular sessions which we called "tune ups" and "loosen ups" explains Adam. 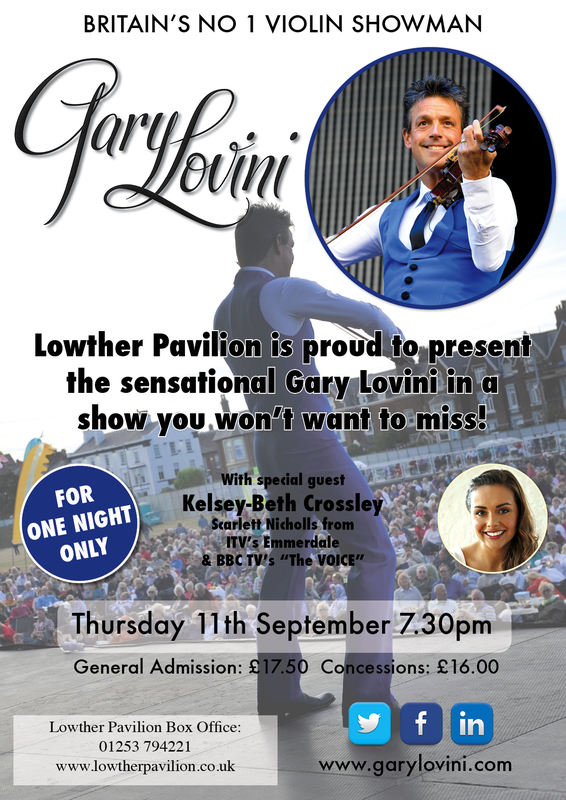 Gary is playing at Lowther Pavilion on Thursday 11th September at 7.30. " Adam helped get me out of pain initially, and since has helped me feel less stiff, with regular tune ups and makes general day to day activities feel easier" says Gary. "He is the man I call if I have any flare ups!" "I cannot wait to see Gary performing, it will be a lot of fun and I feel proud to have been able to help him, just like I feel about all the other patients that attend the clinic" explains Adam. To find out more about Gary Lovini head to www.garylovini.com where you can purchase tickets for the show or purchase some cds!!! 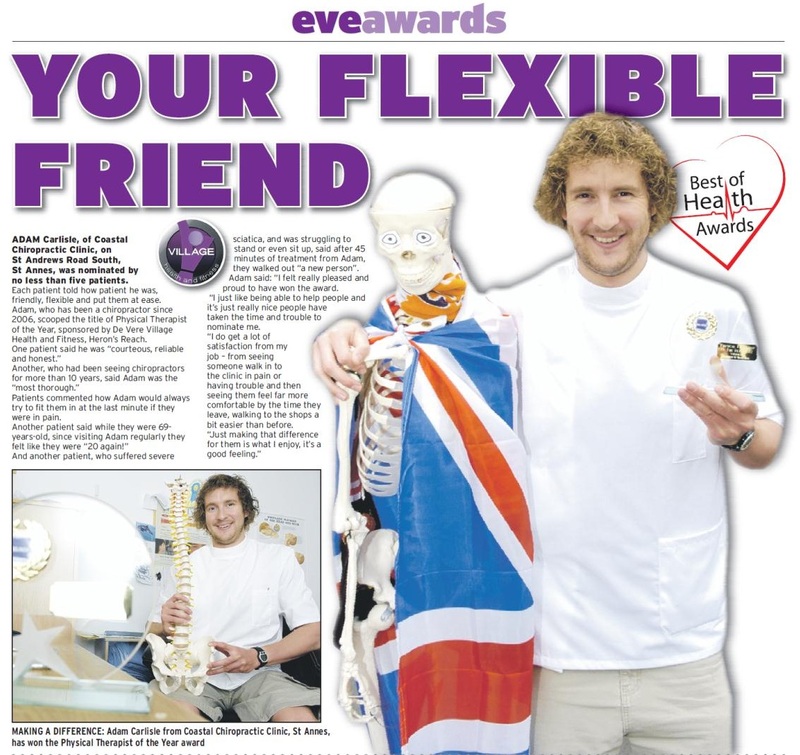 England Goalkeeper helped by local Chiropractor! Blackpool teenager Adam Thomas a goalkeeper, has been recently called up to the England Deaf Futsal Squad for the European championship qualifiers in Oslo. 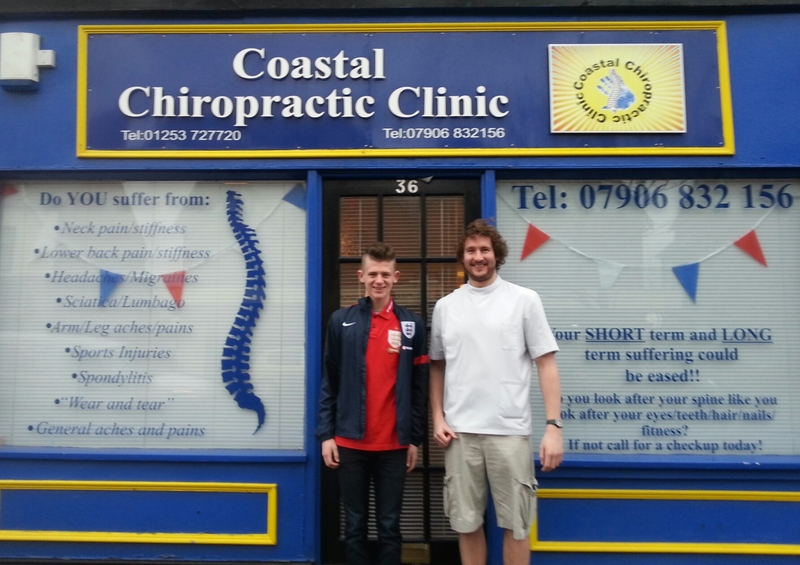 He has been helped along the way by Doctor of Chiropractic Adam Carlisle at Coastal Chiropractic Clinic in St Annes. “I have helped in the treatment of injuries that Adam has picked up through training and games and also helped in reducing the chance of injuries with tune ups and check-ups”, explains Adam the Chiropractor. “Tune ups and check-ups are designed to reduce the stress and tension building up in the muscles and joints of the body and decrease the chance of aches, pains and stiffness from developing”. “I am thrilled for Adam to have his England call up and I hope this is the first of many for him” explains Adam. The team and Adam will play games against Russia, France and Norway with the top two teams in the group qualifying for the European finals held in Bulgaria in November. Adam’s parents, Mrs Jane Thomas and Mr David Thomas, are also patients at the Coastal Chiropractic Clinic and attend for regular loosen ups. “We are extremely proud of Adam for achieving his first cap for England, he has worked hard and all his time and dedication has been worth it”. Chiropractic is a primary health-care profession that specialises in the diagnosis, treatment and overall management of conditions that are due to problems with the joints, ligaments, tendons and nerves, especially related to the spine. Chiropractic treatment mainly involves safe, often gentle, specific spinal manipulation to free joints in the spine or other areas of the body that are not moving properly. Although chiropractors are best known for treating back and neck pain, which they do very well, patients also consult chiropractors regarding a range of other, related conditions. The Coastal Chiropractic Clinic regularly sees sports injuries, along with people with headaches, pains in the neck and lower back from people of all ages. If you have a problem, please do not just put up with it, we may be able to help! Physical Therapist of the Year!!! I have been named the Physical Therapist of the Year award! The Blackpool Gazette have awarded me this due to my great, and amazing, patients taking the time and effort to nominate me, which I thank them for immensely. Unfortunately I was in France on the night of the awards presentation at the De Vere Village Hotel so my mum and dad went to attend. They had a great night, enjoying food, music and the awards ceremony. This is a great achievement and I feel honoured to have even been nominated. Complementary Therapy is now available at the Coastal Chiropractic Clinic. I would like to welcome Miss Zakkara Clark to the Coastal Chiropractic Clinic. She has joined the team to provide a number of great therapies to new and existing patients and friends of the clinic. I have known Zakkara for quite a while so I am pleased she has jumped at the chance of coming to offer her services. She is a local girl from Lytham St Annes and has a great knowledge and understanding of what she does. I would like to wish her all the best in her new challenge. Coastal Chiropractic Clinic has it's second year anniversary! Coastal Chiropractic Clinic has helped improve the day to day lives of many people in the local community and is celebrating its second anniversary. Doctor of Chiropractic, Adam Carlisle, opened the clinic in 2009 with the aim of reducing the aches, pains and stiffness that people of all ages suffer with daily and just put up with. "Many of the patients that book in for an initial consultation have endured neck and lower back symptoms, headaches, shoulder and knee issues for too long. This very commonly has a negative effect on their lives. At the Coastal Chiropractic Clinic we aim to assess and examine patients regularly. This helps to reduce the frequency and severity of their problems with the intention to keep people feeling good." The clinic has helped people of all ages from the young to older ladies and gentlemen. Local swimmer Jo Naylor, 13, first attended with shoulder pain. He benefited greatly from treatment and now attends for tune ups to try to keep him training well and performing at his best. Judith Hargreaves, 37, first started Chiropractic care after walking in needing an emergency consultation following a work related injury. Having suffered for many years with aches and pains, she now feels great. 'Adam helped straighten me up from an injury. I continued with Chiropractic care, and do my exercises advised by Adam, which has helped with daily life and also aided me during pregnancy". “Chiropractors mainly use their hands to help with problems with the joints and muscles of the body, including shoulders, knees and ankles, not just the spine" explains Adam. Coastal Chiropractic Clinic has it's first year anniversary! In 2009 Adam Carlisle, Doctor of Chiropractic, challenged himself to open his own Chiropractic clinic, spread the word about Chiropractic and help people in the community. 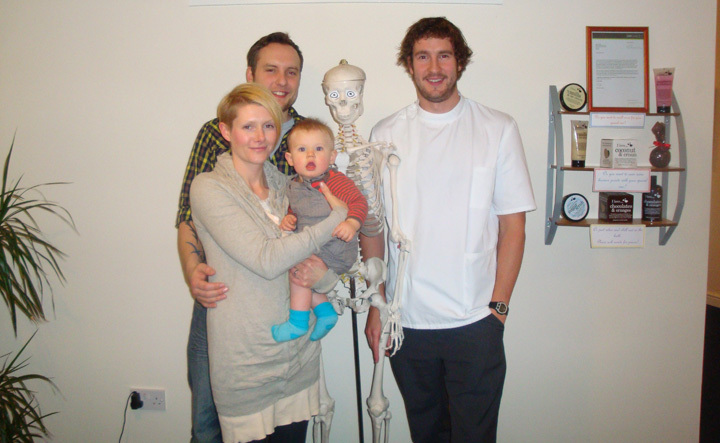 Having lived in the local area all his life, Adam went to study Chiropractic at the University of Glamorgan in South Wales and graduated in 2006. He decided to move back to his home area and use the skills he had learnt and try to help local people. 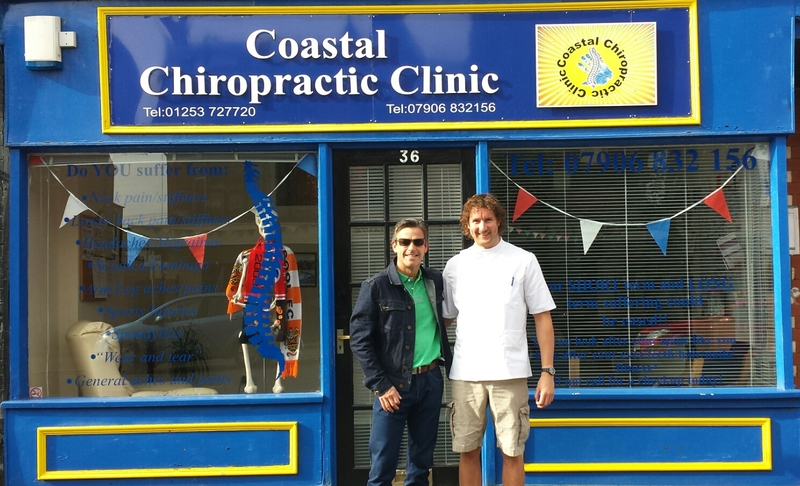 A year on and Coastal Chiropractic Clinic, in St Annes, is thriving and celebrating its first anniversary. “It has been a great year, hard at times but fun. I have met some fantastic people and had the privilege of talking to the Prime Minister David Cameron all about my clinic” says Adam. So far, Adam has been able to help many people such as the Fenwick family. “We started visiting Adam after Jo hurt her back lifting our new baby Noah out of his cot” explains Jamie. “Noah was having stomach reflux problems, and Adam offered to have a look. We’d never heard of a newborn baby having chiropractic but after a couple of sessions we could definitely see an improvement. With Jo’s back feeling much better as well, I thought I’d give Adam a try, as I’d recently had a car accident resulting in constant pain in my back, plus I’d had problem for years with trapped nerves in my neck”. Chiropractic is a health care profession concerned with the diagnosis, treatment and prevention of mechanical disorders of the musculoskeletal system, and the effects of these disorders on the functions of the nervous system and general health. Chiropractic does not involve the use of any drugs or surgery. “I would like to say a big thank you to everyone that has helped me achieve what I have done so far” says Adam. “From Gareth and Jason at the very beginning, to all the people that have given me advice and helped along the way, to my friends and also patients that have helped increase the awareness of the clinic to their own family, friends and colleagues. And, most importantly, a big thanks to my mum, dad and gran”. Many people “put up” with aches, pains and stiffness, along with headaches, as they think this is a normal part of their life when in fact they could be greatly reduced with Chiropractic care. If you are one of these people, please do not put up with it. The Coastal Chiropractic Clinic is offering a discounted initial consultation to you and would like to try and help. All you have to do is quote "1 year" when you attend the clinic.